This item is currently on backorder. Orders containing this item will ship as soon as we have the 1000 ml Nextzett Anti-Frost Concentrate Washer Fluid in stock. Estimated ship date: 8/31/19. When a high end European car manufacturer called Nextzett they wanted the perfect washer fluid to be created that removed ice, prevented ice from reforming, deep cleaned the glass, left no streaks behind while completely safe for the environment and the vehicle. Nextzett's best engineers went to work and created an outstanding formula that did everything they were asked and more. The Nextzett Anti-Frost Washer Fluid Concentrate was created so you can get in your freezing cold car and start driving quickly and safely. Just pour in a 2:1 ratio (water:concentrate), or stronger if desired, in your washer fluid reservoir. When it sprays on your glass it quickly melts the ice and stops ice from forming again so you can drive safely and with confidence. It also does a great job of cleaning your glass leaving no streaks behind so you see clearly and easily through the glass. The formula will not fade or otherwise ruin your surrounding rubber, plastic, vinyl and painted surfaces. Traditional washer fluids often use methanol and or ammonia which can dry out and fade some trim pieces. Instead of harsh chemicals this formula uses pure nature alcohols and it's 100% bio-degradable, so it's environmentally friendly. It even smells pleasant with a citrus based scent. So if you want outstanding results from a top quality product try the Nextzett Anti-Frost Washer Fluid Concentrate today! *Mixing ratios for California customers in "Type A Areas" including Del Norte, Shasta and Trinity Counties; the Great Basin Valley, Lake Tahoe, Mountain Counties, and Northeast Plateau Air Basins. For sale in the Continental US and Canada only. I have not tested it fully yet as our weather is still too warm yet. 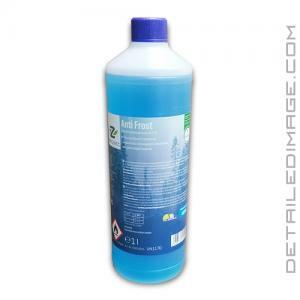 Dilute with distilled water per manufactures instructions and easily melts frost on windshield in morning. Seems to be a good value for the money when its your safety on the line. Pros: easy to use, price. Cons: none so far. I really like this stuff. Won't gum up the works like the orange stuff. Easy to store as a concentrate. Works good. Doesn't gum up sensors and nozzles like that orange stuff.